Well I wasn't planning on sharing this recipe, but I got some special requests from some of my Facebook fans. Plus, my hubby really liked it, and since he is a pretty picky eater I figure that makes it worth sharing! I actually made this one up on my own, taking ideas from here and there, and I love the way it turned out! 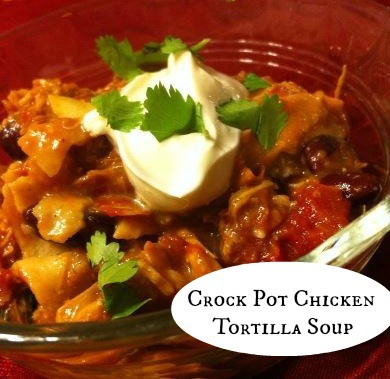 Place the chicken, tomatoes, chilies, beans, broth, and cumin into the crock pot and mix together. Heat on low for 6 hours, or high for 3 hours. Shred the chicken using two forks. Add the kidney beans and strips of corn tortillas and mix together. Add more chicken broth if desired. *Note mine turned out more like chili because my hubby doesn't like brothy soups. It's all up to your own preference! Serve with avocado, cilantro, cheese, and sour cream! Enjoy! Also, him from a new Blog Hop follower! I WILL be pinning this and making it this week! That looks so yummy -- thank you for linking up at Apronista.com! !